We as a Manufacturer, Exporter & Supplier have mastered the art of providing 4 Head Automatic Linear Piston Filling Machine to the customers. Understanding the requirements of customers, we are engaged in offering the best grade. We source the raw material from the most reliable vendors of the industry to manufacture by utilizing quality assured material. Our offered range is easily accessible in diverse specifications in order to meet the changing demands of the customers. This Automatic Linear 4 Head Piston type Filling machine (AEAPFC04500) is manufactured only with the purpose of multiplying the output of any filling unit, where the requirement of products is very high. A very reliable machine with high output is the main motto of ours during the design of this machine. The result was a great success and satisfied our customers to the maximum. All the operations in a particular sequence in this machine give a feeling of a good orchestra performance during a concert. High efficient machine parts and good technology makes this machine the perfect engine to deliver the best. Any Liquids, viscous/ non-viscous products can be accurately measured and filled in any shaped containers or bottles or even tubes with this machine. High output is the main feature of this design, at the same time, a special facility to increase and decrease the speed is also the most advantage of this machine. 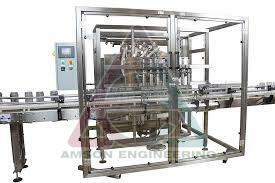 We are assuring an output of at least 60 fills per minute with this four head machine @ 500 ml. Cut off valve provides drip-free filling.